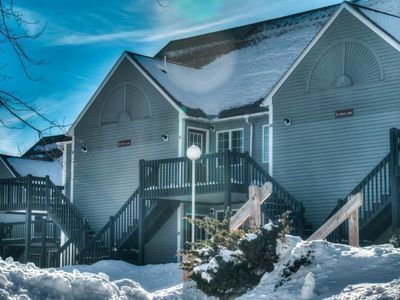 The Riverbend complex is popular for both Owners and Renters, largely due to its easy access to Sunday River resort (it’s located toward the end of the access road, near the Sunday River Brew Pub) and it’s designated stop on the Mountain Explorer Shuttle. It’s also a quick drive down Route 2/26 to Bethel Village or Route 26 for those heading south to go home. The complex has a neighborhood feel and historically has been home to groups of friends. Of course, it derives its name from its location running along the actual Sunday River. Featuring inviting post and beam style one-, two- and three-bedroom units (the latter of which, there is only one), it was built in two phases, 1988 and 1994. The one-bedroom units are on the lower level and the two-bedrooms above. The one-bedroom units are 620 square feet and one level; the two-bedroom units are 940 square feet and bi-level with one large master suite on the second floor. The second phase has laundry hook up, typically a small set up in the downstairs bathroom. Those looking to purchase a three-bedroom at Riverbend may have to be patient as they rarely come on the market. All of the units have decks. Riverbend owners who wish to rent short-term can have great success on their own or through a rental agency such as Vacasa.